–After the power went out on Friday night, we sat around the kitchen table and each read our books by candlelight, which felt quaint and special. –The neighbors facing us had power, so several of us strung long cords across the street and were able to get our sump pumps, refrigerators and freezers going again. –A wonderful neighbor with power got up early and made muffins and coffee to share. She and her little girl brought them door to door, and this brought neighbors outside to talk and share stories, an impromptu gathering. –We were only without power for 18 hours, whereas some in the city were without for 4 or 5 days. 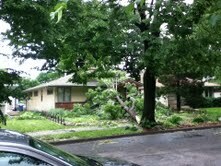 –Due to the severity of this storm, many people had much bigger problems, like these neighbors a block away. 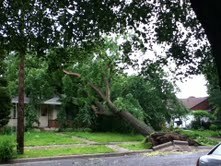 Hundreds of trees are down all over the Twin Cities. Our big old elm in the back yard is still standing (whew!). –We may not have wanted to do it this weekend or in this way, but we’re doing the much-needed cleanout of the storage room. It’s needed a major decluttering. In the scheme of things, our weekend was an annoyance– there are really much worse disasters going on in the world. Tornadoes decimating cities, unrest in Turkey, people with loved ones sick or dying. We have our health, our home and each other. It’s easy for me to get caught up in the “this is awful! why me?” negativity of my own present-moment experience. Yeah, who wants to rewash a bunch of clean laundry that was sitting near the sump pump? Or work on getting cat pee out of a couch. But if I can step back and take a deep breath, sometimes I get some perspective. That was quick! I’m so glad you liked it… We were watching the elm in the back yard through the storm, crossing our fingers. So glad to not have to deal with that kind of stuff!